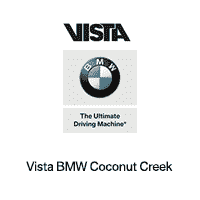 Vista BMW Coconut Creek is a proud member of the community for which it serves. We are a locally owned and operated BMW retailer, and take pride in our South Florida roots. We aren’t some large, impersonal national chain. We are a family-owned local business. We love South Florida and our family will always call it home. And our strong sense of family goes well beyond our staff – we welcome every one of our customers as a family member, too.